Where are you shooting, one might ask. I came home from a long day of teaching and this is what my dining room has turned into! We have had our photography/design studio at the same location for many years. 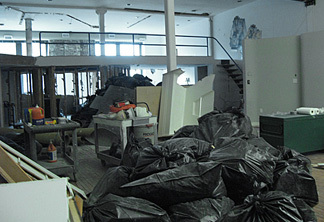 Here is a picture of it several years ago and if one looks closely one can see the reason for change. 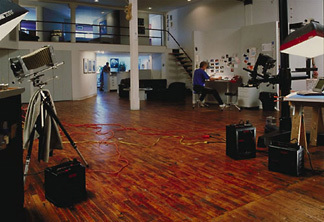 The large format camera on the left uses sheets of film. 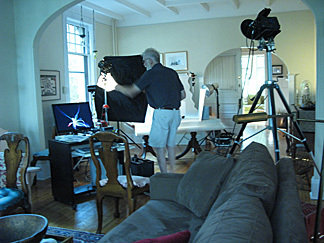 This studio had lots of space devoted to film—loading film, developing film and printing prints—at least 3 darkrooms. We don’t shoot film anymore and haven’t for a number of years. So…we are reconfiguring the space—ripping out everything—dividing it in two and using half to create a brand new studio. It’s exciting on one hand but bitter sweet as the old one is being demolished!